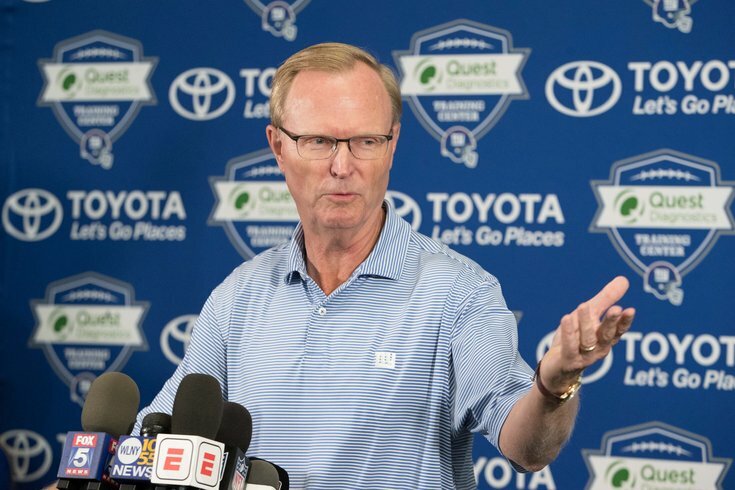 Blaming Dave Gettleman for the tire fire the Giants have become is easy (and valid), but the bigger problem is owner John Mara. From a "fan experience" perspective, the New York Giants' 2018 season went about as badly as it could have, with the team getting out to a 1-7 start, and then proceeding to ruin their draft position with a 4-4 finish. Along the way, star wide receiver Odell Beckham Jr. made a surprise television appearance with Lil Wayne, where he was critical of Eli Manning, the coaching staff, and the team in general. That sit-down pissed off owner John Mara, who said that Beckham needed to "do a little more playing and a little less talking." That interview would ultimately produce one of the most senseless trades in recent NFL history. Two weeks ago, as we all saw, the Giants traded Beckham for 20 cents on the dollar to the Cleveland Browns. Blame has been squarely placed on general manager Dave Gettleman, who is an easy target, given his comical shunning of analytics, and poking fun at the computer nerds who use them. And, well, Gettleman deserves plenty of criticism, but the reality is that Mara is the far more culpable party. It seems pretty clear that Mara simply didn't like Beckham, so he was gone. Otherwise, any other owner would have stepped in and said, "You're going to trade our Hall of Fame-caliber talent for what?!!? I don't think so." This was originally two separate trades that the Giants and Browns just merged into one. It left the Giants without their most valuable player in Beckham, their best pass rusher in Vernon, and $24 million (!!!) in dead money on their 2019 salary cap ($16 million for Beckham, $8 million for Vernon). The losses are pretty self-explanatory. There's really no need to harp on how they'll affect the product on the field going forward. • The 17th overall pick: We'll see soon enough what the Giants are able to do with this pick, but a mid-first-round pick as the centerpiece of a trade for a team's best player is not enough, by any reasonable stretch. • S Jabrill Peppers: In a press conference earlier this week, Gettleman referred to Peppers as a "first-round pick," as a way to pump up the return on the trade. "We got two ones and a three, one of them being a player," he said. Peppers was indeed once a first-round pick, 25th overall in 2017. Except, going back five years (3 with Michigan and 2 with the Browns), Peppers has 3 INTs and no forced fumbles. He has also been a mediocre-at-best returner for the Browns over two seasons. He has not been an impact player, and does not hold anywhere near the value of a first-round pick. To assert that he is worth a first-round pick is laughable. • OG Kevin Zeitler: Zeitler is a good player who will certainly help fix one of the worst offensive lines in the NFL. However, he is also 29 years old with 104 games on the odometer. Last offseason, the Giants made LT Nate Solder the highest-paid (at the time) offensive lineman in NFL history. Solder will turn 31 in April. Gettleman's commitment to fixing the offensive line is fine and good, but he's going about it in a ridiculous way. By adding Solder and Zeitler in consecutive years, he is dumping valuable resources into aging players who either (a) won't be around or (b) won't be good anymore by the time the Giants can become contenders again. • The 96th overall pick: The Browns had two picks in the third round. They had the 80th overall pick and the 95th overall pick that they traded to the Giants. Gettleman couldn't even get the higher third-round pick, lol. • WR Golden Tate: In his new home in New Jersey, Tate will be the No. 1 receiver. In Philly, in a wide receiver rotation that wasn't even that good in 2018, he was barely the No. 3. Tate is best out of the slot, which the Giants already have in Sterling Shepard. Tate will turn 31 in August, and as noted above, likely won't be an effective player anymore by the time the Giants have a chance to contend for anything. He signed with the Giants on a four-deal worth $37.5 million, or $9,375,000 per year. Gross. Mailbag: Should the Eagles have signed WR John Brown instead of DeSean Jackson? • S Antoine Bethea: Bethea will turn 35 in July. Someone asked Gettleman why he's signing all these old dudes. "It’s about accumulating really good football players, who are also really good folks," he said. "The culture is important, I have said it a million times, you guys know that. The bottom line is with the way the game has evolved, 65 percent of the time you are in sub. You need a guy in the back end that can get everybody lined up and make all the adjustment calls. If you don’t have that, you can’t function. "I’ve watched Antoine for years, you talk about a great sixth-round pick. He is an adult, he’s a professional football player. He knows what he is doing, he can still play. I have this crazy idea that age doesn’t bother me. I better because my age doesn’t bother me. At the end of the day, it’s about a good football player. Antoine Bethea is still a hell of a football player, so is Kevin Zeitler, those guys can flat play. Plus, we have 12 draft picks, we are going to be really young. It’s about building a team, it’s not about individual players in silos." The Bethea signing reminds me of the asinine Jonathan Stewart signing a year ago. • OLB Markus Golden: Golden had a nice start to his career under James Bettcher in Arizona, where he had 4 sacks as a rookie, and 12.5 sacks in his second season. He tore an ACL in 2017 in the Cardinals' fourth game, and was ineffective in his return in 2018. Still, finally, at least this signing makes some sense, as the Giants hope Golden will regain his form two years removed from his injury, and reunited with Bettcher. • DL Olsen Pierre: Pierre is another Bettcher guy from Arizona. He showed some promise in 2017, collecting 5.5 sacks as a rookie before regressing last season. Again, at least this signing makes some sense. They would include LB Nate Stupar, LS Zak DeOssie, WR Bennie Fowler, DB Tony Lippett, FB Eli Penny, C Spencer Pulley, and QB Alex Tanney. (Celebration emoji). • S Landon Collins: Gettleman came under heavy fire for choosing not to franchise tag Collins for $11.15 million, especially considering the absurd six-year, $84 million deal he received from Washington. With Collins gone, the Giants have gotten rid of their (formerly) four best defenders – Collins, Vernon, Snacks Harrison, and Jason Pierre-Paul. It cost the Giants $26.2 million in dead money to get rid of Vernon ($8 million), Harrison ($3.2 million), and Pierre-Paul ($15 million). At least it didn't cost the Giants anything to move on from one of their best players this time. Soooooo... progress? • The rest of the Giants’ losses – OG Jamon Brown, CB B.W. Webb, DL Mario Edwards, and DL Josh Mauro – are just bodies. Earlier this week, Gettleman was pressed on the decision not to release Manning, thus freeing up money to add better players. "At the end of the day, when you blow the whistle, 11 guys have to go out there," he said. "I’ve done that study and on offense you have to have a quarterback run out there. I said it in Indianapolis and I’ll say it again, you turn around and take a look at what happened last year once we got that o-line fixed, better, we’re going to continue working on that and look at what we did the second half of the year on offense. This narrative that Eli is overpaid and can’t play is a crock, I’m telling you. "At the end of the day, you guys have to say, ‘Gettleman is out of his mind’ or ‘he knows what he’s talking about when he evaluates players.’ That’s really what it is, that’s really where it’s at and I’m okay if you disagree with me, that’s fine. What I’m telling you is if you turn around and take a look at what he’s making right now, and look around the league and see what quarterbacks are making, if you were in my shoes, you would say, you know what, there is really not -- the way he finished the season and what he’s making -- there really wasn’t a decision to make." Giants fans should consider ignoring the Giants for the foreseeable future, and focusing on the Knicks Mets Rangers Yankees.